I'm a coffee drinker. There, I said it. Who cares, virtually all American adults are fans of the bean juice, right? Well, I got a very late start on the stuff. Over the years I've had a number of lattes, café au laits, mochas and other "training coffees", but not with any regularity, maybe five or six per year. It all started at the Ace Hotel in Palm Springs, just before Christmas. I was late in joining the family for breakfast and didn't get a chance to order my OJ. 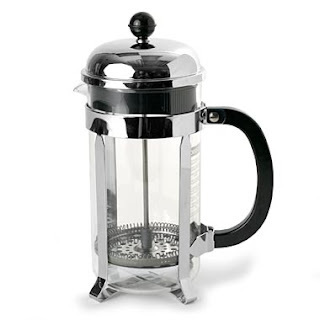 However, my father-in-law had a French press filled with Portland's Stumptown Coffee and he only required a cup. So I gave it a shot. And liked it. A lot. 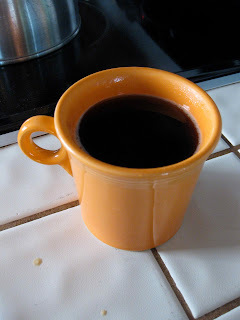 I have always prided myself on being a morning person who didn't really need the caffeine jolt to start my day, and seeing my parents as morning "coffee zombies" at times during my youth turned me off on the idea of the morning jump start provided by coffee and tea. But back to the coffee, maybe it was the years of silly sugary espresso drinks, maybe those coffee-loving taste buds finally developed after thirty nine years, who knows. 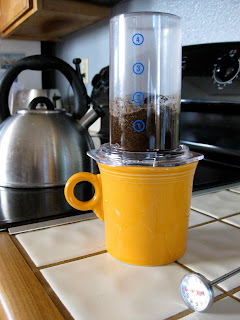 Upon returning home I ran off to buy a French press and some coarse-ground coffee to brew at home. 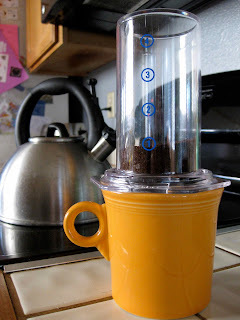 The resulting coffee was strong and sometimes sludge-like towards the bottom, but after reading more about coffee prep online, I found the right water temp, brew time and how you should pour all of the coffee out of the pot after four minutes to prevent it from becoming bitter. 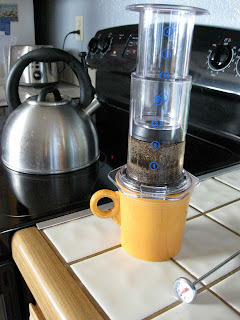 I also learned about the Aeropress. Basically an oversize syringe (giving new meaning to a shot of joe), the Aeropress makes 1-4 espresso shots, into which you can top off with hot water for an Americano. and voila, a smooth, rich-tasting cup of joe. What's next? Maybe I'll start appreciating wine by the time I turn fifty. Well I never thought it would happen. And, as usual, you're approaching this with zeal of a convert. ;-) Welcome to the Dark (roast) side. Lynn and I had a similar coffee epiphany, although ours happened in our mid twenties. When we first moved back to Denver after getting married, we stayed for a few weeks at her middle brother's house. There we had, for the first time, real FRESH GROUND coffee. Hmmm...tasted a lot different than the Folger's crap my parents would PERK (shudder!). There have been fresh beans in the freezer and a grinder ever since. 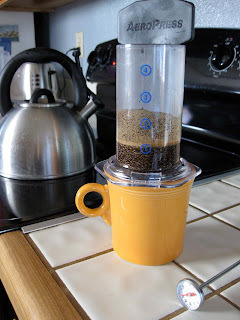 We have always used a simple Melitta drip (with #6 unbleached filters)and pretty much nothing but French Roast or Espresso with non-Columbian beans will do. The State Journal had an interesting article about home roasting last week. It looked very interesting and fun but, guess what, I already have too many hobbies. 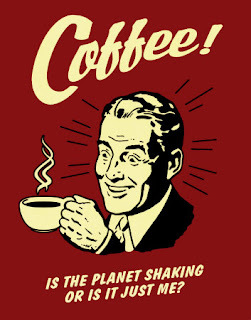 I will confess to drinking nuked coffee that has sat on the counter for a day, however, so I'm not THAT much of a purist.